First birthday parties are a celebration of family, the birthday child, of parenthood and honestly the fact that any parent makes it this far with chronic sleep deprivation is worthy of an almighty celebration! How you choose to mark this occasion is as individual as your precious birthday child. Whether you throw a catered party, complete with entertainment and a wedding style cake, or a relaxed afternoon tea with family and close friends in the backyard, make it fun and enjoy celebrating your little cherub. All our Party in the Box themes come with invitations to match your chosen tableware. If you’re wanting to add something personal to your party, did you know that you can personalise stamps with Australia Post? You choose a theme (they have heaps which are suited to a 1st birthday), upload a photo and then you choose how many sheets of stamps you want to buy. Each sheet of 20 stamps costs $25 and they look delightful as well as being a memorable keep sake. 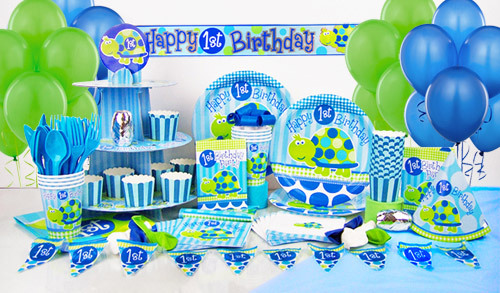 Choosing the time of day to host your party is important when your birthday child and guests may still have day naps. Try to schedule your party for just after your child usually wakes from their nap so they’ll be awake and fresh for longer. Balloons are a must when decorating for a first birthday. If you can afford it, getting some of them done with helium is fun for kids to play with as well as making a room look fantastic. There are some great high chair decoration kits on the market that you can buy. Most come with bunting to go around the tray as well as a mat to go under the highchair and catch all stray cake crumbs. Food is just as much about the adults at a first birthday, so try to make things that both the kids and the grown-ups like. Adults love reminiscing with frog in the pond, party pies and chocolate crackles. Give them permission and they’ll enjoy tucking in alongside their kids! Most one year olds haven’t had many lollies, cakes or sugar so some healthy alternatives like tubs of yoghurt, fruit skewers and jugs of water will be appreciated by kids and adults alike. Unless you have older siblings/ friends at your party you don’t generally need to run games at a first birthday party. Pass the parcel is fun as a one year old might be able to play if assisted. If you have a picnic blanket or kids rug set this up with some durable toys so younger kids can play quietly for a while to escape the party chaos if they want. For my sons first birthday I made my first ever birthday cake. I went easy… an iced number one covered in smarties. And what a cake it was – it sank in the middle and the icing was so runny all the smarties ended up sliding off the sides. I hid it in the laundry till cake time, bought it out, sang the quickest rendition of happy birthday in history and sliced it up like a ninja before anyone could take a photo. If you’re not confident attempting a themed birthday cake, ask a friend to help you. I didn’t do party favours at my kids first birthdays because I didn’t want any babies choking on small toy parts. 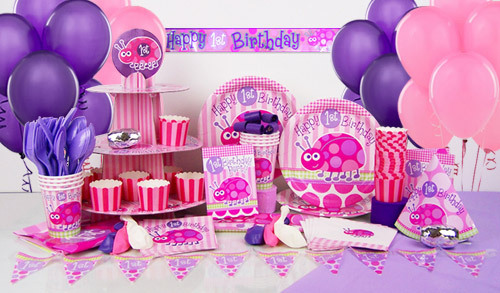 Instead you could send your little guests home with a helium balloon or cupcake. If you’re doing party favour bags for older children, don’t give them out till they’re leaving so nothing ends up on the floor for your lighting fast crawler to find.